The quiet of the mountainside is mocking us. I have to stop every few yards, and despite the quiet and heavily falling snow all I can hear is the colossally loud thump, thump, thump of my heart trying its best to keep up with the rest of my body. There is nary a breath of wind, copious snow falling and despite temperatures in the teens I am spending much of my time desperately trying to keep cool, not warm. 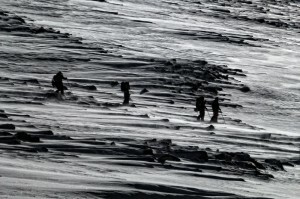 This battle will define almost an entire day in an epic uphill slog to the Polar Star Inn, buried in many feet of Colorado snow. I’m hauling a pulk, a specialized ski sled that I’m pulling behind me and cursing my legs which only an hour ago had been surprisingly strong. Enough so that I had actually volunteered to pull the damn thing. Of course, back at that point — already more than four hours into the day — the falling snow hadn’t added pounds of weight to the sled, nor had the walls of snow on the trail been deep enough, unlike now, that the sled was now dragging on them and creating even more resistance. I could only hope that we would make it before dark; or perhaps I could only hope that we would make it – at all. Lets back up a bit to the innocent offer that got me into this situation. I’ve skied often enough over my life, including teaching ski racing to kids. And while I’ve been on a few trips involving snowcats, guides and such I’ve never done a whole lot on my own with out-of-bounds skiing. So imagine my surprise when a neighbor offers that he has a spot left for a hut trip. Well, maybe I will do it finally. Get out there and see what it’s all about. After all, I have backpacked before (cough), many years ago (cough). How innocent. How insane. I had nothing resembling the proper ski gear for this kind of trip. Ski testing days were booked, ski shop boot fitting began and a litany of gear later I would add new mid-fat skis, new bindings which can easily toggle between alpine or touring mode, new softer boots, new skins, new shovel, new probe and an avalanche beacon. Next came the training. I just happen to have in my house one of those athletic impediments called a preschooler. So the starting point of my fitness level was not exactly inspiring. But I dutifully planned it out over three months and figured I could make it, maybe as the weakest link, but still make it. I even tossed in a day of uphill skiing at Loveland to practice. All of which adds up to a recipe for a very novice hut trekker. Along the way it was clear that my neighbor was very much on top of planning things, sending out regular emails on food, avalanche safety and such. So I didn’t think too much about anything other than my pack. Being the typical busy parent it was a great thing…at least until we got out on the trail. The day of the Big Trip started far too early. By 4:30 a.m. we were already packing the car before driving from the Denver metro all the way to Eagle on I-70 before driving 20 miles south into the heart of the mountains. Our group had already dwindled to three from the planned four due to sudden work commitments. Weekend warrior-ing is a tough gig. We ended up with: the organizer, Gary, a road bike and outdoor fanatic; a doctor friend of his from Texas, Sam, who was also an in-shape road bike aficionado; and of course yours truly. We reached the parking lot somewhere around 9 a.m. just after snowy I-70 closed just behind us due to accidents. Several inches of new snow draped the access road and a single lonely car sat in the remote parking lot to greet us at the start of our trip. After readying our overly ample gear we huddled in the car for warmth one last time. How quaint an idea! The last thing we needed was more heat, though it sure seemed like a good use of our time at that moment. 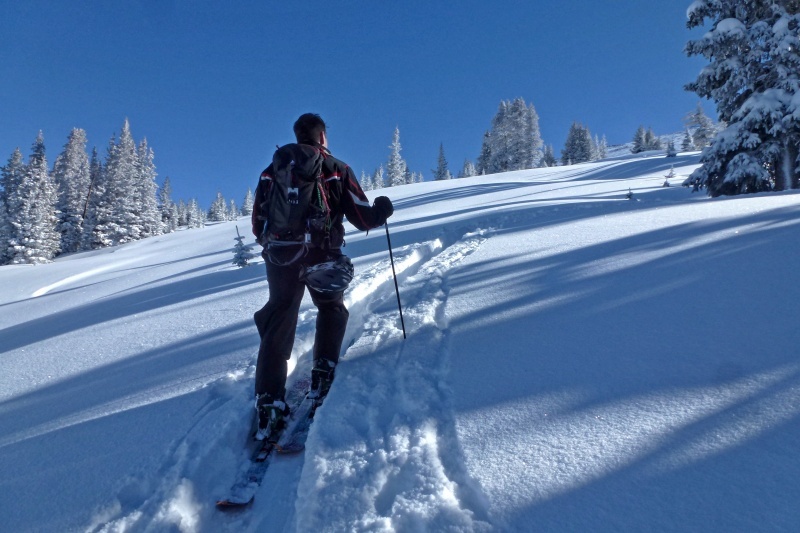 The first four miles of our six-mile ski had seemed steep enough, following a summer-time dirt road. A few sections were generously flat and there was even one short downhill. Despite the cold and snow, keeping a steady pace without overheating was the real challenge. OK, that and the fact that I had been the only one to pack any food in the outside pockets of my pack. Good thing I had two pounds of good sweet and salty gorp mixed up, because we needed it. My mistake was with water. I had 100 ounces. In a Camelbak pouch. With a sleeve on the tube and valve that supposedly protected it from cold weather. Let me be the first to tell you that those tubes freeze solid in short order, insulated sleeve or not. Try digging out the giant bag and drinking from it mid-trip. Good luck with that, especially when your pack is probably holding 45 pounds of gear – including such brilliant gems as extra shoes for going to the outhouse at the hut. How foolish. How rookie of me. Fortunately, my traveling companions had Nalgene bottles. They bartered in water, I bartered in gorp. Rookie helping rookie. The thing was, we were four miles into a six-mile trip and hadn’t really done much more than stretch our legs at that point. For soon after leaving the road, things really pitched up and I quickly found myself in charge of the organizer’s ski pulk. It was heavy, it was overloaded for what we really needed. But foolish me, I had just had some gorp and was feeling strong at that moment. The mountain, though, had other ideas. For despite my exercise routine I could only drag myself up into the woods a few dozen yards at a time before resting. Pull and rest. Pull and rest. Somehow this was still enough for me to pull out ahead of my companions. At least there was no issue following the trail up though the aspens and evergreens. We had since been passed by another group heading to the cabin, leaving a well-defined skin track in their wake. The whole trail, all six miles of it climbed 2,000 vertical feet. Much of the climb, of course, came in the final two miles. 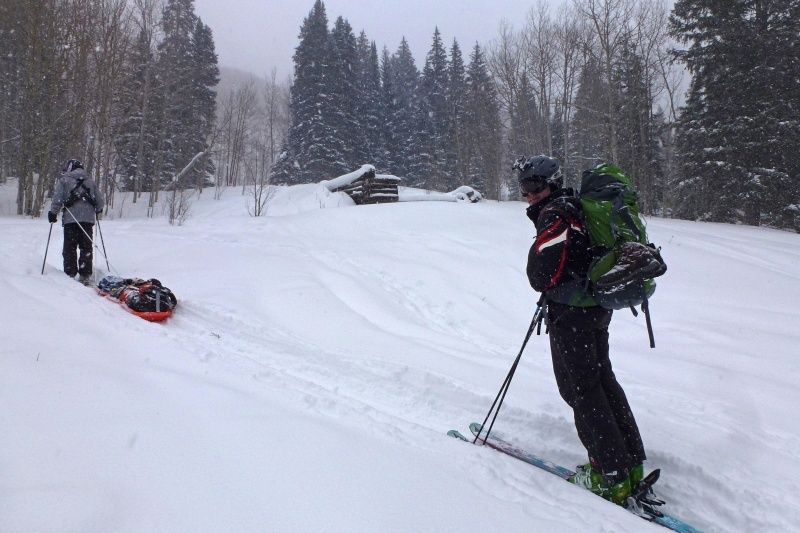 By the time we managed to reduce our suffering to the final mile, the snow had become deep enough on the trail that the sled was now wider than the ski tracks ahead of us. Yes that’s right, I was now literally dragging the thing through the snow, not just up the hill. Somehow I stayed ahead of my two companions as the whole expedition ground to a crawl, or maybe less. Do we dump some gear and come back? Do we try to plug on? “Ahh, there’s enough time before dark, let’s plug on,” was the decision. So we all dutifully complained about how we’d never do such a long slog again, and somehow managed to make it to the hut just as dusk was settling in. The best news of our day was that the previously cold hut was now nicely warming from the fire in the wood stove started by the group that had passed us. At least one member of that group started much later than we had, and yet passed us like we were standing still – as he hauled a case or more of beer. We soon learned that he lived in Eagle and it was thus simply expected that he should be capable of such things. We flatlanders can’t be expected to be able to do something like that. At least that’s the theory I still stick to today for my own comfort. The Polar Star Inn sits at over 11,000 feet on the west side of New York Mountain. 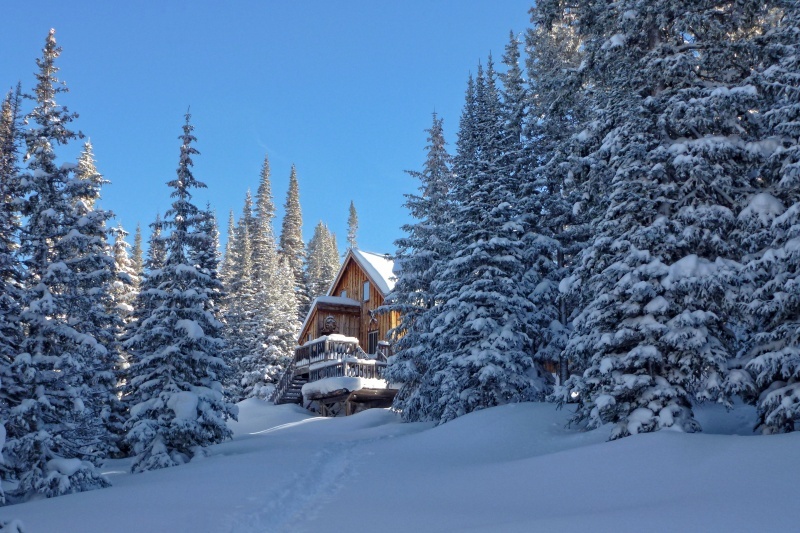 While it is privately owned, it is managed though Colorado’s 10th Mountain Division Hut system. Ironically, it is only something around six miles as the crow flies to the top of Beaver Creek and its ridiculously plush hotels. But of course, you can’t get here from there and who would want to? We’re here for the wilderness. Never mind the birds, the foxes and pikas laughing at us hauling tons of gear through their homes. Polar Star is a roomy and comfortable lodge focused mostly on functionality. It has a very interesting system of propane lamps built in, you know, the “old school” kind used for camping with the mantles that you light. There are a few bunks located downstairs, and a bunch of rooms upstairs including a large common room with four bunk slots. It comes fully equipped with a two-holer out back, propane stove, two wood stoves, and even a well that works in the winter, though we filtered the water just to be certain. A rack for drying your skins sits conveniently next to the cooking wood stove. After a hardly remembered meal and a few sips of wine my shoulders could barely move from hauling my pack for four miles and the sled for another two. While the other crews staying at the cabin that weekend (who were clearly in better shape) dutifully set to making sure that the couple of cases of beer they brought wouldn’t go to waste, cards were played for ridiculous things like push-ups for the loser, as no one had any money on them. At some point the honorable decision to sleep was eventually made by all. The new day dawned gorgeous, with the sun slowly taking hold on the west side of New York Mountain. The hut had warmed overnight nearly to the point that it was uncomfortable for sleeping. Our trip organizer prepared a nice breakfast omelet, ham and even toast. It must be said that Gary did indeed pack good food, so we enjoyed some benefit of slogging it all in with the pulk. I quickly became clear that Gary wasn’t there for the skiing. So instead, Sam and I talked with four others who were already poring over maps and making plans for skiing. After some discussion we decided that there were some open slots above the cabin near treeline that should provide good skiing, while of low enough angle that the avalanche danger would be fairly low. It also helped to be on west-facing slopes where danger was rated much lower than the “considerable” applied by the Colorado Avalanche Information Center to nearly all other compass directions. It must be said that while I’ve skied “backcountry” a number of times (snowcats, Alps guided, etc. ), and have learned quite a bit over the years, this was my first direct experience with picking my own lines, directions, sense of safety, etc. I’m certainly still no expert, but you definitely have to put on the big boy pants and be prepared out there for yourself and the potential for consequences from your own decisions. Learn as much as possible, and then be conservative with your ski choices. We held a quick beacon search for practice along the trail before putting our skis back on. Sam, who is an ER doctor, pointed out that if you’re ever digging someone out from an avalanche, only focus on rescue breaths, not full CPR. They need oxygen, not necessarily work on their heart muscle and rhythm. It was something that I’d never really considered. The woods above Polar Star are both reasonably open for climbing, but also wooded enough to make direction and location a bit confusing. 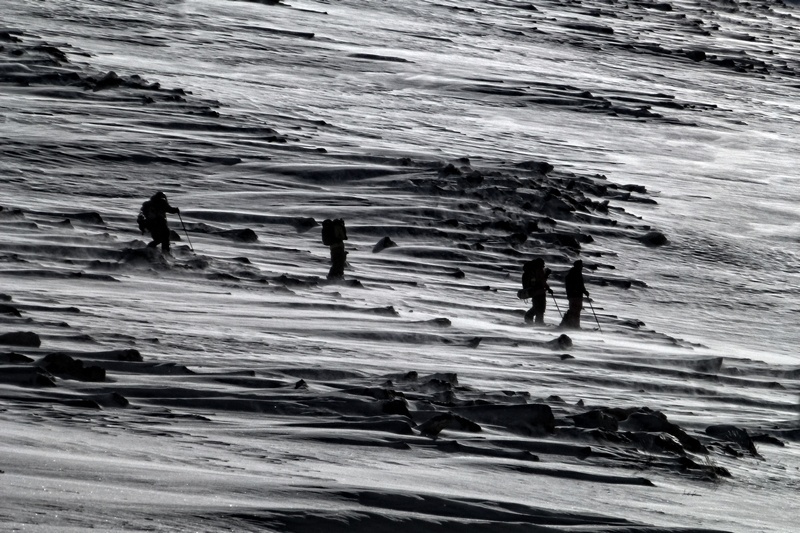 We stopped several times and conferred on deciding on a path that pushed on up above treeline. After a couple of false starts that cost us 20 minutes, we found the route and climbed to the first of the open areas right at treeline. The snow was very deep, and in sections if you broke trail you would sink several feet into the snow. It was a lot of work to gain some altitude for skiing. We eventually gained the treeline on a gorgeous day of sun and spectacular snow conditions. After a short break taking in the views and eating a quick snack it was time to finally – finally – ditch the skins and do some actual downhill skiing. You would think there might be a powder frenzy after so much work, but I think everyone wanted a guinea pig. 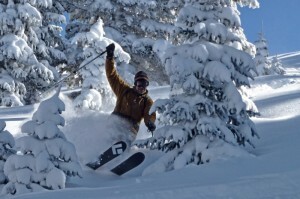 I was actually encouraged to go first in some spectacularly righteous powder on a beautiful sunny Colorado day. 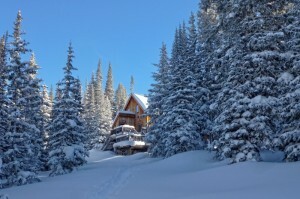 This — this is the reason backcountry skiing and the hut system both exist. If you are lucky, or work hard with insider knowledge of a particular ski area, you might get a couple of runs like this on a powder day. Otherwise, with the insane in-bounds pace in today’s ski world you’re left with just scraps of chewed up powder. After just one spectacular run, and with lunch time having not yet even arrived, our four partners from the other group somehow decided that they were already done for the day. Wait, what? I’m really not sure how that works exactly, but Sam and I chose to press on, switching back to skins to head back up for more. By the time we summited for a second time near the ridge line on New York Mountain, the wind was starting to pick up a bit ahead of yet another approaching cold front. We quickly switched back to downhill mode and grabbed some more sweet turns. It was only early afternoon, but given our relative inexperience in the backcountry and the increasing wind we decided that it was time to head down. We picked our way down, taking slightly different lines than the four who had descended ahead of us, though we eventually ended up on their tracks just above the cabin. It appeared that other skiers had been out, for there were several sets of tracks going different directions. Confusion in the middle of the woods. There must have been some internal GPS in me that day, for I picked the exact line that took us directly to the back of the cabin. Clouds held off that afternoon, making for a very special sunset that can only be appreciated by having put in your own effort to even be there at all to see it. And once again, as the temperatures dropped we were toasty warm, and even had to open the windows to keep the temperature down. 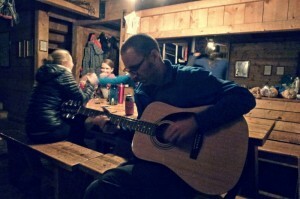 At some point during dinner a resident hut guitar was pulled out to reveal that only four of the six strings remained intact. One of our day’s ski mates had played guitar in a band and actually came up with several songs that could be played using only those four particular strings. BS’ing, drinking and card gaming later, it was time once again to shut the eyelids after a long but fruitful day. Day three arrived in similar fashion to day one: it was snowing. If the weather had been clear we probably would have gone back for one more quick run, but we weren’t convinced that we’d find our way back quite so easily and it turned out to be the right choice. As we started packing our bags and the sled to descend it was apparent that Gary had brought at least two or three extra meals per person. Along with a bag of trash (pack out what you bring in! ), this was not going to be a lightweight affair. We started out fairly soon after breakfast, only to find that Gary was not quite up to skiing down. Despite a number of days on snow, he was a rank beginner. He was nervous as heck about it and couldn’t manage his speed, even though it was very easy skiing. He repeatedly skied straight into the soft snow and crashed into the edges of the well-packed trail. Whumph! Each time he would wallow in snow so deep that he was pushing against essentially nothing but air. It made for a great workout at 11,000 feet, but he was going to burn all of his energy in just a few hundred yards that way. So we then tried to add him to the sled, which Sam was hauling at that point. No go. He was too heavy, too high up off the ground. The sled simply flipped over after a few feet. The simplest solutions, however, are sometimes the best. It turns out that enough people had come up the main ski track that it was just barely packed down enough to walk on. Gary only sank a few inches and wasn’t putting post holes in the track. Much slower than typical skiing, but much better than burning energy and time floundering in the wilderness. For how much uphill pain we had endured, it was shocking –shocking, I tell you — to see just how flat the ski down was. I did get to cut the corners of the trail off a bit here and there for some powder turns, but not very much. The steepest sections came a mile or so into the descent. Something along the lines of a blue square resort trail, but narrow as a ski width and ungroomed. With a huge amount of weight and a significant amount of momentum, Sam eventually crashed after rounding several corners at too fast a speed. You can guess who picked up sled duties at that point. It actually was some of the best of the downhill of the day. Why? Well remember that “slight downhill” we had on our way up the mountain? Well that just turned into a mile of “slight” uphill and dead flat terrain. Sam and I alternated pulling the sled100 yards at a time via walking, but the snowfall had come hard and steady. Four inches of new snow was now tugging at the sled which was now draped with ski boots, as by then Gary had switched to his hiking boots and was walking well ahead of us. We even managed to talk a random snowmobiler into dragging the sled up the hill once we were half way up it…only to have the sled flip over after a few hundred yards. The ‘biler unceremoniously left it there and continued on his way. It was probably a good choice on his part. That damned sled was becoming the ungluing of our sanity. We imagined the birds, squirrels and foxes simply watching us and having themselves a good laugh. We cursed the day we ever saw the ski pulk as we alternated tugging it all the way up that damned mile, waiting and begging for the downhill to come. In some ways the downhill never came. Much of the final three miles, while technically downhill, are of such a low angle that you barely moved with all of the new snow. Sam took over the pulling and I remained behind, using my momentum to bump into the sled to get it moving. Or even just using my ski tips to push on the sled to get it moving. This lasted for way longer than it should have. There were simply way too few of the sublime moments when the pitch became sufficient to actually ski downhill. In some ways the ending was anticlimactic. We had been carrying two-way radios, and when Gary radioed that he’d reached the car we were only a half mile behind him and almost going downhill. After packing the car I pulled off my ski boots to get a look at my throbbing toes. Oh, the toes…the toes. Both big toes were black from blood beneath the nails. Our friendly ER doc, Sam said that if the pain became excruciating, I should sterilize a small drill bit and drill a hole in the toenails to relieve pressure. He said that’s basically what they do at the ER, but for several thousand dollars. My toes remained black even several months later, but I never did lose the nails or have to drill them. What lessons would you learn from such an adventure? 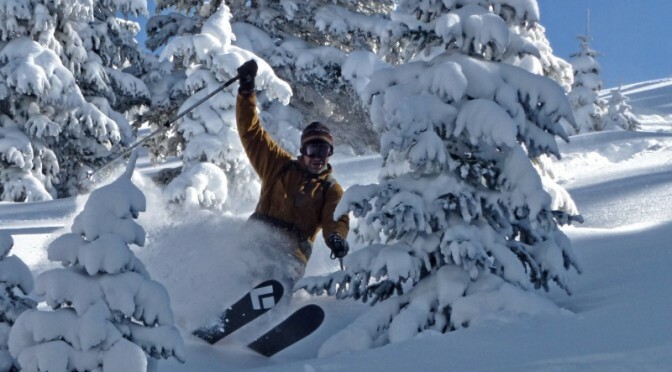 Sam learned that he’s never going to do that kind of trip again and plans to ski Vail and Beaver Creek more often. He also sent a set of how-to-ski DVD’s to Gary. Gary actually began talking about all sorts of extra gear he thought he needed to bring the next time. He wanted a tent and a camp stove and, and, and… just in case we’d had more difficulty getting into the hut and had to bivouac in the woods. Sam and I resoundingly pushed back hard on that. I very much advocate doing a few shorter trips to get used to the process and figure out what is actually needed, not just a never-ending list of gear to carry just in case of any one of a million different contingencies that may happen to someone, someday, on a trip somewhere. Gary himself is very much undeterred, having embarked upon a couple of additional, more successful Hut trips late in the excellent Colorado ski season of 2013-14. As for me, I’m still glad that I went. However, I would never go back to a hut with a six-mile slog to get to. It’s fine for some, but for me it’s more slogging than is necessary for the experience, or for fresh turns. There are quite a few huts with much shorter jaunts. 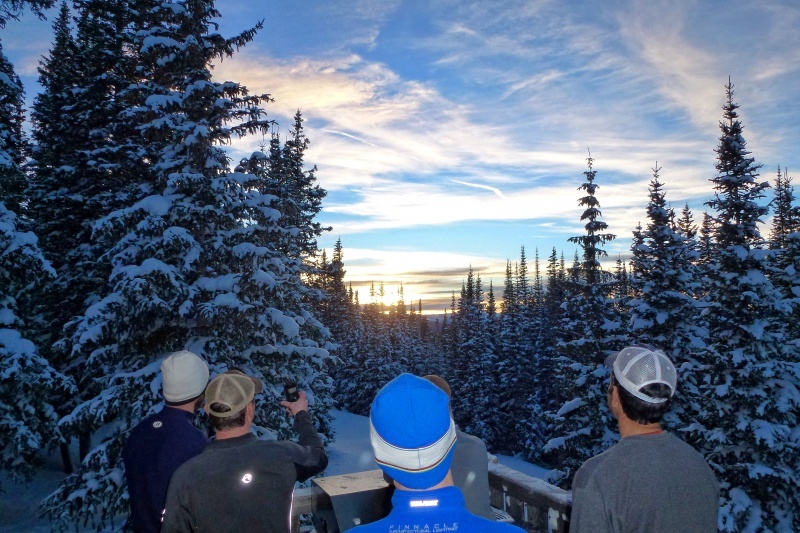 I do enjoy the wilderness, and the skiing certainly is far above the vast preponderance of anything you can get at even an exclusive resort like Beaver Creek on your typical day — unless you have the time and funding for snowcat or heli-skiing. I’m sure that in the not-too-distant future I’ll be back in the woods again, but never again pulling a ski pulk around. Oh, and one last thing: some of the names and details have been changed to protect the innocent.